AMD is a company that really needs no introduction. 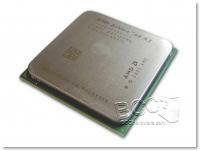 AMD Desktop processors have been widely used and enjoyed by users since the days of the K6-3 series. Their processor history extends much earlier than that, but the K6-3 is where things really started to take off for Advanced Micro Devices. 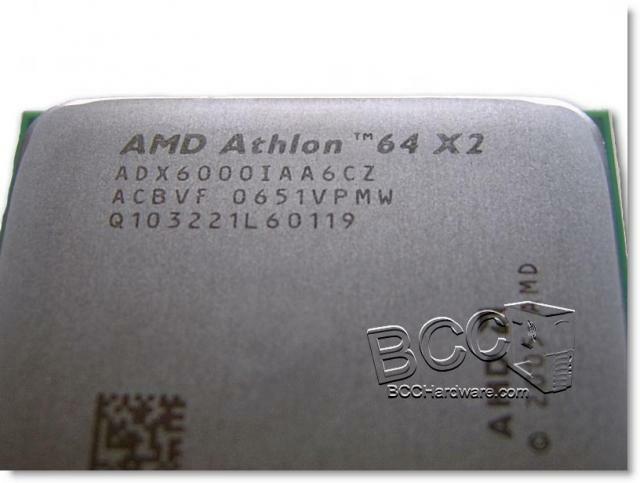 Years later AMD introduced the world's first consumer oriented 64-bit processor - the Athlon 64. They were also the first company to release a fast Dual Core 64-bit processor as well. For years AMD has ridden on their success and up until Intel launched the Core 2 processor, they really had nothing to worry about. Today AMD launches their fastest Dual-Core AM2 CPU yet - the Athlon 64 6000+ X2 Dual Core Processor. This processor is still based on the aging 90nm process and comes clocked in at 3.0GHz (15x200) and has 2x 1MB L2 Cache. We have been playing around with this processor for a couple of weeks now and have ran a multitude of benchmarks to see if this processor is a worth choice for AM2 users, or if the mid-range Intel Core 2 Duo E6600 can beat it mercilessly. It should be an interesting showdown so you'll want to keep reading. AMD has pioneered Dual-Core computing and they have some benefits over Intel's Dual Core processor in some areas. 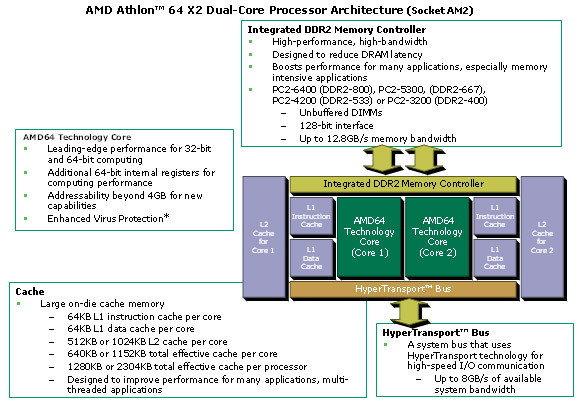 Below is a diagram from AMD that shows how the the X2 Dual-Core processor gets the job done. The Integrated DDR2 Memory Controller and the HyperTransport Bus allow lightning fast performance across the system bus and to the DDR2 memory. As you will see later in this review, AMD has a distinct advantage in this area over Intel. We received an OEM tray CPU 6000+ X2. The model number on this particular CPU is ADX6000IAA6CZ. As far as we can tell this is a 89W CPU that actually is quite easy to cool - unlike some 125W processor from AMD. On the next page we'll cover the processor specs, overclocking and thermal properties of this CPU.